There’s More to Paint Than Colour - Darmax Inc.
Usually when you think of paint, it’s all about the colour. 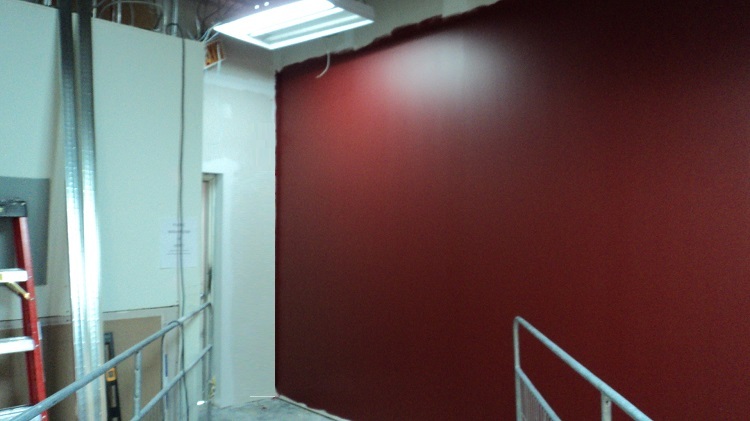 Have you ever stopped to wonder if you’re choosing the right type of paint for your store or office interior? Many people default to “eggshell finish please” and don’t give it another thought. Here’s a story about what using the wrong paint finish can do. Of course we also have some tips on choosing the right paint for your application. On one of our recent projects we were hired in by the building owner to build some walls in a unit and get them ready for painting. We finished the walls smooth and ready for priming & painting. At that point another contractor was brought in to paint the unit by the tenant. The new tenant was responsible for the final painting. After the painting was complete we were surprised to find out that the tenant was unhappy about the finish of the walls. We went back in with the building owner, the tenant, and an Engineer to find out what happened. The trouble was mainly that the new tenant could see all the blemishes in the finishing of the walls. The store lighting wasn’t completely installed yet. The sunlight through the front windows without proper interior lighting made blemishes more visible. Once the regular store lighting is functioning, it is likely that any imperfections will be less visible. The tenant chose a dark colour for the walls. As paint colour darkens, finished surface blemishes become more apparent. The tenant chose high gloss paint. The sheen of the paint makes the difference in texture between the mudded/taped joints and the regular drywall surface, more visible. All of this caused extra time and expense on the project as everything had to be repainted. The Engineer recommended a special heavy duty primer to better ensure all walls were more consistent before that second attempt. How can you avoid the pitfalls of incorrect paint finish choices? These finishes are smooth, velvety and help to hide imperfections on less-than-perfect walls. Because matt surfaces don’t reflect light, they make all colours look as similar as they can be in very different light conditions. May be more difficult to keep clean and may require more frequent touch-ups. This would not be a good choice for a high traffic area. You can wipe satin wall finishes which makes them very practical for higher traffic areas. If you have less-than-perfect walls, the lumps and bumps may show up a bit more. This finish can be good for kitchens, conference rooms, doors and trim due to its durability. Better durability than matt or flat finishes but not quite as good as satin. It gives a beautiful classic look to woodwork – and can also be used on walls when you want a heritage style look with a tough finish. This has a shiny finish, reflects lots of light and is perfect for paler colours. You have to have a great surface to make it look its best as it does show imperfections. High durability makes washing easy and it resists humidity well. This is great for doors, trim and cabinetry as it adds contrast to walls that are painted in a matt. Also good for kitchens, washrooms, hallways and other high traffic areas. When selecting your paint, think beyond colour: consider the function of the room, and the atmosphere you’d like to create. Doing so can prevent a lot of frustration and possible business interruptions. Remember, you can always ask a professional for guidance too.